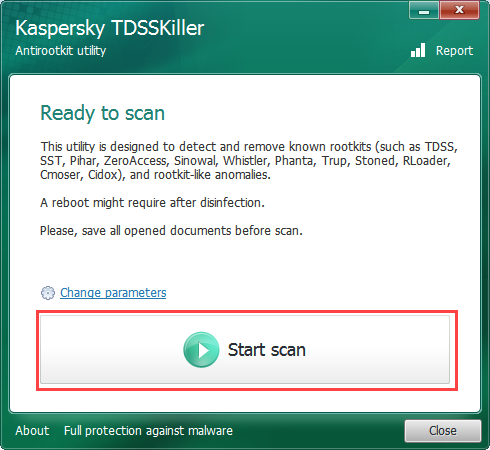 Use the TDSSKiller tool to detect and remove the rootkits and bootkits listed here. To remove other viruses, download and install the Kaspersky Virus Removal Tool. You can run the tool in normal, safe, or silent mode. Run TDSSKiller.exe on the infected computer. Carefully read through the Kaspersky Lab End User License Agreement. Click Accept if you agree with all the points. Carefully read through the Kaspersky Security Network Statement. Click Accept if you agree with all the points. Wait until the scan and disinfection have been completed. You do not need to reboot your computer after disinfection. -accepteula Confirms your acceptance of the End User License Agreement. -l <file_name> Write the report to a file. -qpath <folder_name> Select the location of the quarantine folder. -qall Copy all objects to quarantine, including clean ones. -qsus Only copy suspicious files to quarantine. -qmbr Copy all master boot records (MBR) to quarantine. -qboot Copy all boot sectors to quarantine. -quefi Copy all UEFI extensions to quarantine. -dcexact Automatically disinfect or delete known threats. Apply it with the key -silent to disinfect a large number of computers in a network. -qcsvc <service_name> Copy the specified service to quarantine. -dcsvc <service_name> Delete the specified service. Detect files that don’t have a digital signature, or have an invalid one. These files could be infected. If you suspect that it’s an infected file, send it to VirusDesk to be checked. -tdlfs Detect TDL-3/4 system files that are created by TDL-3/4 rootkits in the last hard drive sectors for storing files. All these files can be copied to quarantine. -silent Start a silent scan. This can be applied in order to start the tool centrally across a network. -freboot Install the extended monitoring driver and reboot before scan. -fixmbr <drive_name> Restore the master boot record (MBR) on the specified disk drive. -fixboot <partition_name> Restore VBR and EIPL on the specified partition. How to remove malware belonging to the family Rootkit.Win32.TDSS (aka Tidserv, TDSServ, Alureon)? Kaspersky Internet Security 2016 delivers premium protection for your computer. Apart from protecting your PC against viruses, the application provides safe use of your webcam, credit card information and saves your children from unwanted content. Advanced security technologies also allow you to block online tracking and data collection, prevent OS and browser settings changes, as well as to exclude all the unreliable sources.